One of the most popular questions people ask, is what are the best underwater camera settings they should use for macro or Wide-angle underwater photography, on a digital camera. There is no 1 setting for all shots, but I try to give people an idea of what settings they can start with, and how to adjust them underwater. After reading this section, you should read the section changing settings during a dive. This section covers digital compact camera settings and dslr underwater settings, for all digital cameras such as the Canon G11, Canon G10, Canon G9, Canon S90, Nikon D90, D80, Nikon d300, d300s, d700, Canon 20d, Canon 40d, Canon 50d, Canon 5d, Olympus e330, e620, e3, Fuji, Sea & Sea DX-2G and all other cameras. Put your camera in macro mode. In auto-mode, with the macro-mode on, the aperture will default to F8 on some cameras. Turn the flash to forced flash mode. Focus mode to spot focus. Keep the zoom in the widest setting at first. Once you get comfortable taking macro photos, you can start zooming out to get more working distance between your subject. Use base ISO (usually ISO 100, sometimes lower). If your camera has full manual mode, use F8, 1/1000th shutter speed. The fast shutter speed will block out ambient light. Once you are comfortable, try zooming in half-way on some shots. If you camera does not have full manual mode, use Aperture priority mode (Av mode), set at F8, otherwise use program mode if Av mode is not supported. 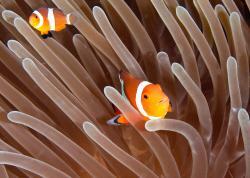 Read this article on underwater camera modes. On a compact camera, when using the internal flash, auto-mode can work fairly well for macro photos. But give full manual mode a try if it is available. For people using an external strobe, I highly recommend using manual mode. For people who haven’t shot in manual mode before, it often sounds difficult, with lots of settings to worry about. In reality, it’s very simple. Make your initial settings, and then start off only worry about changing one parameter. It’s actually quite simple! Unless you are an advanced user, if you have full manual mode, I don’t recommend starting off using aperture priority mode or shutter priority mode if you are using strobes, unless full manual is not available. Manual mode, Base ISO (usually ISO 100 or 200), F13, 1/200th (or whatever your maximum shutter sync speed is); single-spot focus; center-weighted metering. Aperture may need to be lowered to F7-F8 or a larger aperture for fish shots. When shooting small objects, shoot at a smaller aperture (up to F29) for more DOF. If shooting supermacro, use F25-F50 with a 100-105mm lens. If you are worried about diffraction, see my diffraction test results. When starting out, leave your strobes on 1 power setting (full power or half power, depending on how strong your strobe is). Adjust your f-stop depending on the distance to the subject, and other factosr. For example, F22 for very close up, F11 for 1ft away, F8 for 2 ft away, etc. Important: you need to get used to changing your f-stop (aperture) for different kinds of shots. It is very important how the aperture effects your shot, depth of field, and the background. Make sure you review the aperture & depth of field section. Note on underwater settings: people will give different opinions on the best initial setting for macro with a dSLR. Some will say shoot at F22, others will say F14, etc etc etc. The truth is, you should learn the difference between these apertures. I'm constantly changing my aperture on different shots, depending on what I want to accomplish, changing from F2.8 to F32. If you haven't read the aperture section, please do. Please see the section Changing settings during the dive for more details on changing these settings during a dive. I strongly suggest using manual mode. Manual mode, Base ISO (usually ISO 100 or 200), F8, 1/100th; maximum number of focus points; matrix metering. Shoot at F11 if you are close enough to your subject and have the strobe power or available light. During the dive, adjust shutter speed up or down for desired background color. Changing the shutter speed only effects the background exposure. This is because your strobes fire almost instantaneously. Read the section on choosing shutter speed, and the tutorial on wide-angle underwater photography. Be sure to utilize your dSLR's Instant Recall Modes. Shooting wide-angle with a compact camera & strobes is very similar to shooting with a dSLR. Read the paragraph above. Try manual mode, ISO 100, F5.6 - F8, 1/100th - 1/200th depending on the light. Turn macro mode off, flash off, set your custom white balance, use Evaluative (matrix) metering, try focusing on taking photos in shallow sunny water (25ft deep or less). Shoot in aperture priority (AV) mode if available at F2.8, otherwise use program mode. Start at ISO 100, but increase your ISO if you are using F2.8 and your shutter speed falls below 1/30th for still objects, 1/60th for slowly moving objects or 1/125th for fast moving objects. Photo taken at F8, ISO 250, 1/25. Oil rigs in california. The water was dark, so I had to shoot at 1/25th to get the green background in the photo. The shutter speed did not affect the fish and colored anemones lit by my Inon Z240 strobes. Experienced users can also try aperture priority or shutter priority modes under certain circumstances, like rapidly changing ambient light conditions. Aperture priority mode, F7, exposure compensation at –1 or –1 ½. This is helpful if your background lighting is constantly changing (e.g. trying to shoot fish that may be above or below you). If you are shooting fast-moving subjects, and are worried that the subject will not be completely lit by the strobe (and therefore freezing the motion), you can use shutter priority mode, 1/125th (or faster), with exposure compensation at –1 or –1 ½. Please see the section Changing settings during the dive for more details. 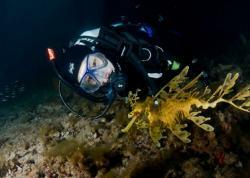 On night dives, there is no ambient light, except from your dive light. Set a fast shutter speed to block out the light from dive lights. If you are shooting with TTL, you can simply shoot away, and adjust your aperture as needed. Otherwise, you can leave either your strobe at one power, and change the aperture to get the right exposure, or fix the aperture at one setting and change the strobe power as needed. Before going further, I want to talk about one thing. People who just get new dSLR's are constantly asking me what underwater settings I use, are there any custom menu settings I need to know about. After mastering aperture and shutter speed, you should try to think about the photographic process, about your composition, subject selection, lighting, etc. I don't think the other 100 settings on a dSLR will have much effect on your photos compared to understand the photographic / creative process behind photography. White Balance: Auto white balance. I use matrix metering for wide angle, and center-weighted for macro. If you are shooting with your strobes on manual, this will have no effect. First, read more about color temperature. I set my white-balance to auto when using a flash or strobe. If you are using a dSLR, and you are not happy with the white balance you are getting, you can set a custom kelvin white balance to the color temps of your strobes. For example, 4800K for ikelite DS-125s, 5500K for Inon Z240s. If you are shooting in Raw, you can adjust the white balance after the fact. Use a manaul white balance (custom white balance) with a white, gray, or silver object when shooting ambient light. Read more about manual white balance and setting white balance in the lighting section. I often use center spot focus for macro, and all focus points for wide-angle shots. If you are in center spot-focus mode, and your camera allows you to move the focus point, I highly recommend you take advantage of this feature. If your camera has continuous focus mode, also called servo-focus mode, that means the camera will continuously focus, and allow you to release the shutter at any time. I often use this mode with low-contrast subjects, in low-light, and when doing supermacro. 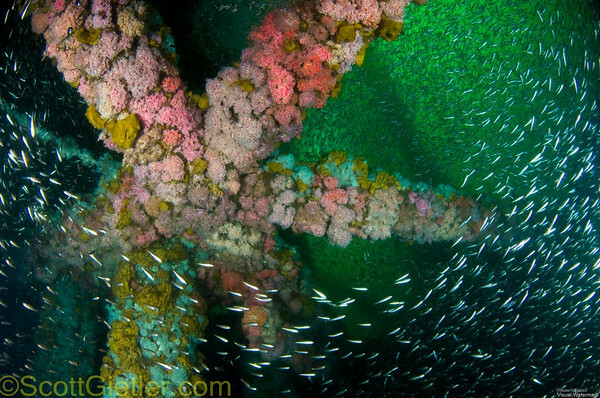 This article on low-contrast underwater photography may be helpful. I adjust this with my C/S/M switch on my Nikon D300, and I use this switch often. Most compacts have a macro mode for shots closer then 12-24 inches. Trying to take macro shots without going into macro mode is guaranteed to cause many headaches! Make sure you understand the range of your lens when in macro mode, and out of macro mode. dSLRs have the option for shooting in adobe RGB, or sRGB. Adobe is a larger color space, is better for printing, and is the recommended color space. However, you might have to convert to sRGB for posting photos to the web. sRGB is the color space used on monitors. There are also other color space options, but these are beyond the scope of this guide. There are entire books out on color spaces. 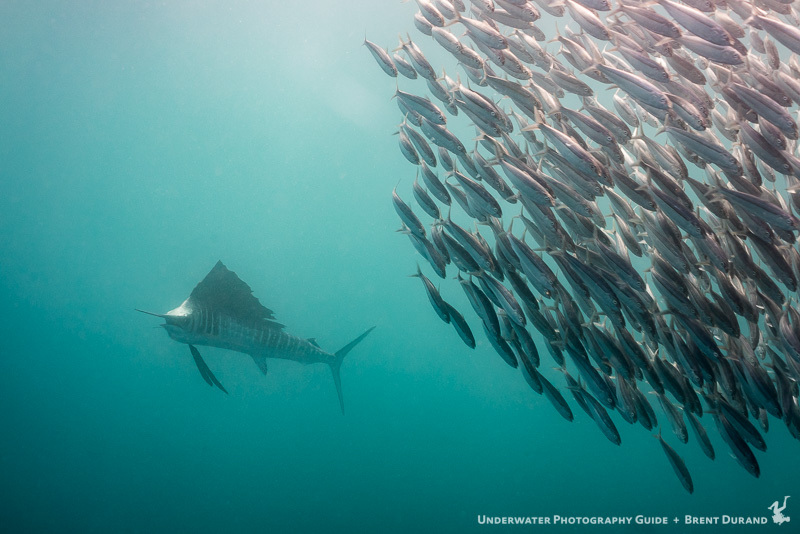 When shooting in JPEG, UW photos often look better in vivid mode, especially since color saturation is sometimes reduced lost when light travels underwater. Give it a try, you can always turn it off if you think your photos are coming out too saturated. Objects that are very red can get oversaturation, so if you are shooting JPEGs, you might want to turn this setting off, or make sure you don't overexpose. Many dSLRs have a setting for High ISO noise reduction, which will be turned on only for ISO above a certain number, e.g. ISO 800 or above on the D300. I leave mine on normal, but some people prefer low or off, since the noise reduction is in effect slightly blurring the photo. I usually keep this at normal. My dynamic auto-focus area is on 51 points (A3). The right combination of settings will make all the difference when shooting extrememly fast subjects like this sailfish off Isla Mujeres, Mexico. Sony a7R II with Sony 28mm lens + fisheye converter. ISO 500, f/5.6, 1/320. Underwater settings on cameras such as the Canon g9, g10, g11 or Canon S80, S90, Fuji F50, Panasonic, Sea & Sea DX-2G are similar. If your camera has full manual mode, use it, otherwise with aperture priority mode (AV mode) if your camera supports it. Most of the time you will set the camera to ISO 100. Don’t have AUTO ISO on. Read more about setting ISO. Read more about using your compact camera modes, and getting great colors in your photos.